I’ve had a pretty busy time watching bands lately and haven’t got round to writing about them, so I thought I’d pool them all together into one mega-post. 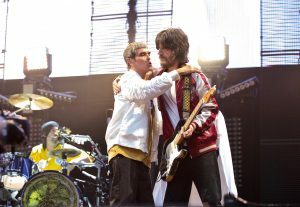 First up was The Stone Roses at Wembley all the way back in June. I went to this one with Christina and her boyfriend Tom. We travelled up with the Big Green Coach company. It was quite a lively busload of people and it was fortunate that booze was allowed because the upward journey turned out to be quite a long one with two stops along the way. We arrived at Wembley and Christina was quite overwhelmed by the sheer numbers of people, many of whom were wearing the standard bucket hats and it occurred to her that the Stone Roses were a bit like a cult, which I suppose they are in some ways. We had one drink at a pub near to the stadium before heading in. Christina and I had standing tickets while Tom only had a seating ticket but incredibly enough, Christina managed to smuggle her boyfriend through the turnstiles so we were all together. Straight away we headed for more booze. I think the Sleaford Mods were on when we got there who I was not especially taken by. I had thought that the line-up of support acts for this gig was quite poor. We missed The G-O-D, whoever they are, then as mentioned were the Sleaford Mods before Blossoms which was one of the support acts at the Etihad the previous year so it was a bit disappointing for me as I didn’t really rate them last year. A couple of times at this gig, the three of us managed to get separated and in the vastness of Wembley it was unlikely we were going to find each other again so in fact I ended up watching the majority of the Stone Roses on my tod. Overall I was disappointed as the band still does not vary the setlist and of course there is still only the one new song, All For One, in the set. I was quite near to the front and from my vantage point Ian Brown’s vocal did not impress. I am still a worshipper at the feet of the Gods that are The Stone Roses but sadly I was left underwhelmed by this live performance. Thank God as the gig drew to a close I bumped into first Tom and then together we bumped into a slightly drunk Christina who was sitting outside, easily able to be picked out in her multi-coloured bucket hat. It was fortunate that we found her because I think on her own she may have struggled to find our waiting coach outside. But find it we did and then there was just the journey home during which I seem to recall Christina and Tom mostly nattering about their favourite type of music, industrial metal! 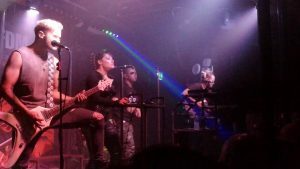 A gap for a couple of months before my next gig, KMFDM at the Fleece in Bristol. Going to this gig was kind of arranged by Christina. Once again I was with Cris and Tom, plus this time, Naz and Zoe came along. We were delayed in leaving Cardiff and had to pick up Zoe on the way from just outside Newport so we only made it to the venue just in time to see the headliners shortly after they’d taken to the stage. I’d driven to this gig so couldn’t drink too much but I still enjoyed the evening, mostly hanging out with Naz and Zoe while Tom and Christina were straight into the moshpit down the front. The band was really not my cup of tea, but it was one of those nights where the company made the night more enjoyable. Just a few days later was a gig I’d really been looking forward to, John Mouse at Clwb Ifor Bach. John is an old friend of mine, but we’ve been out of touch so I was looking forward to catching up with him. Tickets for this gig were just a fiver which was a real bargain especially as the two support bands turned out to be excellent. First up we had Rainbow Maniac who I’d not heard of before but they really impressed me with an indie sort of style reminiscent of The Strokes. They are definitely a band that I think we can expect to see a lot more of. Next up was HMS Morris who are a two piece consisting of female vocalist plus a guy on keyboards. Hard to pin down their influences. They sounded vaguely trip hoppy at times. Overall enjoyable. Finally, John Mouse took to the stage. John is really good at working a crowd and I think everyone loved his set. He had a full band which included two former members of a band called Prince Edward Island who I learned on the night are no longer going which is a shame. For me, on the basis of good value for money, this was probably the best gig of all the recent gigs I’ve been to. My brother was with me at the John Mouse gig and it was Ade who suggested we go to another gig a couple of weeks later. He’d seen headliners, The Shimmer Band on Soccer AM and was anticipating that the gig might be popular. However far from being sold out as he suspected, the crowd was minimal to say the least. In the unusual venue of the Glee Club, we paid just over a tenner to see four up and coming bands and in fairness, each band had its merits, so again, quite good value. I suppose The Shimmer Band were probably the best of the bunch with the singer coming on in hoodie and shades with Liam Gallagher-esque swagger. None of the bands seemed too bothered about the sparsity of the crowd. I suppose bands have to be used to that when they’re starting out. The very next night myself and good friend Tim Brenan had tickets for The Jesus and Mary Chain. I’d been thinking of going to this for some time but was put off by the ticket price, £30. However, as it was close to my birthday, my dad got my ticket for this one. This gig was at Cardiff Uni. I think the ticket price must have been a little off-putting for many as I don’t think it was anywhere near a sell-out and really you’d think that a band as well known as the JAMC should be getting close to selling out. Along with most of their classics, they played a few songs from their new album Damage and Joy which is not at all bad. I was disappointed they didn’t play “April Skies” but overall I thought they were very good despite looking a bit long in the tooth these days. Two encores just about justified the hefty door charge. Tim and I had started in the Pen and Wig, continued at the concert, and then carried on drinking back in the Pen and Wig so we were both quite drunk by the end of the night! Fortunately, unlike Tim, I didn’t have work in the morning. Personally I don’t know how Tim manages to drink so much on “school” nights and still make it in to work. Next up for me was Oxjam on 7 October. This was a day long festival over around seven venues. I’ve no idea what happened to the publicity for this event but the turnout was very poor. Possibly it was due to the proximity to the Swn festival which also takes place in October. I got to see one of my favourite Cardiff bands Shop Girls at least. They played in the Big Top which is the upstairs section of Ten Feet Tall. In fact it was just singer James on his own, ie. without full band, but James is really good at playing solo – always entertaining. And again, no grumbles about lack of a crowd. Well then a couple of weeks later on 21 October was the big one, the Swn festival, as mentioned. I can’t help think that some of the acts myself and my friend Sue saw were not much better than some of the acts we’d seen at the Oxjam a couple of weeks previously. Oxjam was a charity event, and Swn was three times the price, so quite odd really. I guess it’s just down to organisation. There was only one band amongst the Swn line-up I’d heard of and that was Rainbow Maniac who I’d seen supporting John Mouse, so seeing them again was a must for me. Unlike for Shop Girls, the Big Top was packed out for this one and Rainbow Maniac once again delivered a feverishly feisty set. I spent most of the rest of the time going between the upstairs and downstairs rooms of Clwb Ifor Bach. My next gig was Wire, again at the Fleece on 25 October. This time, along with Naz, Tom and Shaky Tom, we went on the train so I didn’t need to worry about my alcohol consumption. I didn’t really know much about Wire but I’d been told to listen out for a post-punk sound. The sound I actually heard was something between a 4AD band and a more downbeat Teenage Fanclub. To be quite honest, the band kind of passed me by as I’d seen so much live music lately, but I still had a good night. Going up on the train made it more fun. We had to get a fair few taxis which made the night a bit more costly, but sometimes you have to not worry about things like that. After the gig, someone recommended we go to the Lanes which is a venue I’ve been to a couple of times, once to see Tom Hingley (superb gig), and once to see The Moons which was also a top night. The Lanes had had a refurb since the last time I was there. There was a DJ but Naz, Tom and I didn’t stay in the main room, instead going upstairs to play pool and have a go on the karaoke machine which was in a side room. This turned out to be a pretty good laugh as we got the air guitars out for songs like “Motorcycle Emptiness” and “Common People”. Finally it was time to catch the last train home. Finally, the most recent gig I went to was another Oxjam event at the Andrew Buchan a short stroll from my flat on Saturday just gone (28 October). I met up with Blakey who lives nearby for this one. Of course we drank Rhymney Export which is probably the best pint in Cardiff. I missed the start as I was at the Cardiff v Millwall so I missed Dave Daggers’ band. But the line-up we did see included a poet, a couple of folk musicians and headlining was an indie-type band called Excellent Skeleton who weren’t at all bad. Autumn always seems to be a busy time for gigs and I think I did pretty well this autumn by getting out and about and seeing plenty of live music. We should be thankful that the music industry ain’t dead yet!